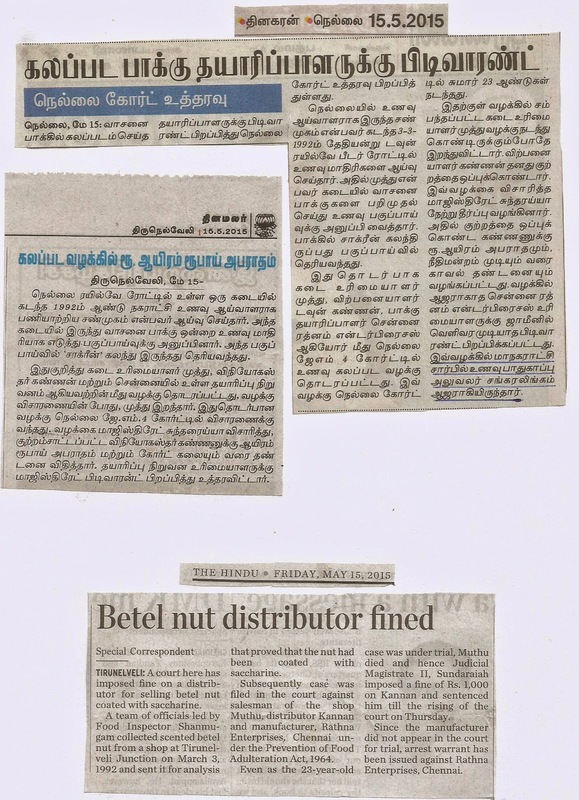 The Judicial Magistrate No.IV, Tirunelveli has convicted the Distributor of Scented Betelnut for having distributed the Scented Betel-nut adulterated with saccharin. 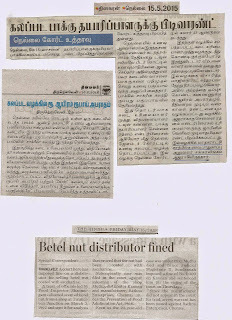 The case was filed by the then Food Inspector Thiru.Shunmugam of Tirunelveli Municipal Corporation. Previously the Food Inspector had lifted the Scented Betelnut from one Muthu who was selling it in Railway Feeder Road, Tirunelveli Town. Analysis showed that the sample of betel-nut was adulterated with Saccharin. A case under the Prevention of Food Adulteration Act,1954 was filed by him. There after the Food Inspector has attained superannuation. Then the case was handled by the Food Inspector A.R.Sankaralingam who joined the Tirunelveli Corporation in the year 2001. The Judicial Magistrate has fined the Distributor to undergo imprisonment till the raise of the court and also with a fine of Rs.1000/-, who had admitted his offence after a period of 23 years.